Today's prompt for #AMonthofFaves is either a book review or a discussion of your choice! Link up at Girlxoxo. Since we're talking about favorites and all, let's talk about a graphic novel I read recently that I absolutely loved. 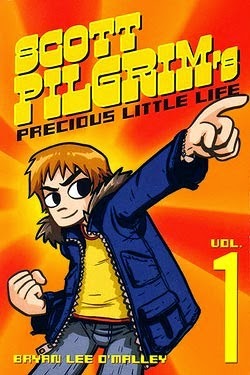 This is not new, just new-to-me...Scott Pilgrim's Precious Little Life (volume 1 of the SP series), by Bryan Lee O'Malley. I picked up O'Malley's newest graphic novel, Seconds, a while back, and I loved it too. So I'm not sure why I was leery of ole Scott Pilgrim. I think for a long time the plot synopsis put me off, but that was a mistake! Scott Pilgrim's life is totally sweet. He's 23 years old, he's in a rock band, he's ""between jobs,"" and he's dating a cute high school girl. Nothing could possibly go wrong, unless a seriously mind-blowing, dangerously fashionable, rollerblading delivery girl named Ramona Flowers starts cruising through his dreams and sailing by him at parties. Will Scott's awesome life get turned upside-down? Will he have to face Ramona's seven evil ex-boyfriends in battle? The short answer is yes. It's so stinking fun. In O'Malley's creations the odd and impossible integrate seamlessly with the characters' reality. It's nothing for a dream to become real or everyday life to mimic a video game. Underneath the fun and the cleverness, it's a really thoughtful statement on generations of young people for whom video games and "play" are a significant part of everyday life. It's also a great look at young love and figuring yourself out. The artwork is another great layer of storytelling here. There's a heavy Manga influence. It makes for a visually interesting comic but still one that's easy to read for those who may not have been sucked into Manga style just yet. I feel like I'm doing a pretty terrible job explaining this book, but if you're down for a little whimsy, a little magic, and a while lot of cleverness, give this one a go. I read Scott Pilgrim at Vance's urging a few years ago and have to admit I didn't really "get" it. I think maybe I'm too old. This looks like a fun read. I've seen it around but never really looked at it. Now I'm intrigued! Belle, it's just great. I love the whimsy and silliness of it. The art is fabulous. Love it all! Ack, I forgot about #AMonthOfFaves. What an airhead. Scott Pilgrim sounds fun. I'm all for a bit of whimsy and magic. And cleverness. Amen sister! Feel free to jump in on a month of faves any time! I read this not long ago after reading Seconds. I loved it! I just borrowed volume 2 from the library and am looking forward to fitting it into my reading pile.